I've always loved the turquoise/tiffany blue color and it's exactly what I have in mind for my May 2007 wedding. The problem is finding affordable bridesmaids dresses in that color. So far I found amazing dresses with a tiered skirt by Jenny Yoo that was around 400 dollars - a lot to ask of my maids I think. (The image below is featured on TheKnot.com and is obviously not in the color I'm describing)here. I did find a similar style from Eden Bridal - another company that I'm not as familiar with, but now that leaves me with another dilemna. (Aside from it being a bit darker than I hoped for - but they style is comparable). If my maids are wearing Tiffany Blue or Turquoise, what does the Maid of Honor wear? I like the idea of turquoise and yellow but then it will require the centerpieces to be yellow, wouldn't it? I know that I could go with another dress but it was already so hard finding a dress in this color. I just don't want to make the bridal party look clownish by injecting TOO MUCH color. So, I thought I'd ask you ladies for your advice. What color gown can the Maid of Honor wear without clashing too much? UPDATED: I just found two dressed through Bari Jay's (I'm learning a lot about different designers today!) 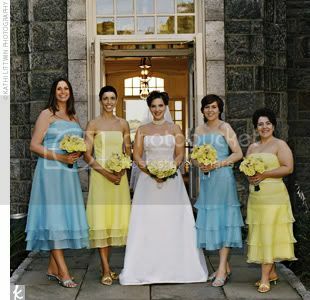 that I think could work for Bridesmaids and Maid of Honor (respectively) both in Tiffany Blue and White. What do you think?? Those are very cute and *gasp* something they'll actually REALLY be able to wear again. Could they all wear the same dress and you can distinguish the MOH with a special bouquet or jewelry? I like the top (yellow) dress better - the layers are adorable.